I love Spring for lots of reasons. I get to start my garden after a long cold winter, I get to swap out the red winter decor for some great green stuff, and Easter, the high Christian holiday. 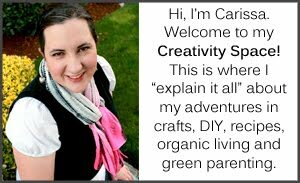 I found one great craft from each of these categories that I'm totally loving and thought I'd share for my fellow spring lovers. While I love the idea of plantable seedling pots, I feel like they frequently don't work out because the bottoms usually decompose slower than the roots grow to the bottom of the pot and need more space. That's why I love these. You put paper towel tube pieces in a water proof tray and fill with dirt. There is no bottom so when it's time to plant you don't have to worry about cutting out the bottom or dealing with plants that don't have enough root space. While the twine is pragmatic (keeps the tube from unrolling when it's wet) it makes it look super cute. I found these over at Homework: Today's Assignment, Be Inspired. I love staggered height candle holders. These are easy to make, super cheap (way better than the $10+ for each piece you'd pay even at IKEA prices) and GREEN. Check out the tutorial over at Two Twenty One. Cindy actually made these to be treasure "blarney stones" for St. Patrick's day. Which is cool if you celebrate St. Patty's (we're actually not big St. Patty's day people). 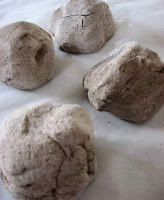 Why I think these are AWESOME though, is because you could make them egg shaped and do these for Easter. If someone can't find an egg, you don't need to worry about it starting to smell or attracting animals. They are made with non toxic ingredients (can't say that about plastic eggs). AND smashing your eggs open with a hammer is a ba-zillion times cooler than opening plastic eggs (especially when you have a family full of little boys like we do). Check out Cindy's brilliant idea and tutorial over at Skip to My Lou. 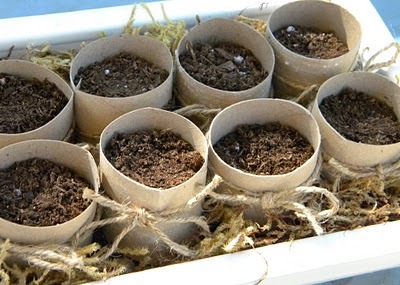 Thank you so much for featuring my little paper towel roll seedling pots. I'm so glad you like the project. 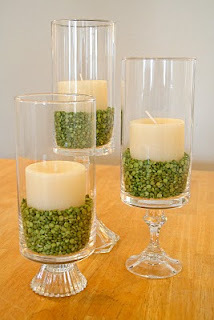 I saw some lentil & coffee bean votive holders at PCC last fall - they looked really cute. I like the split pea version too. I love spring too with its warm temperatures and sunny days. I also love the ideas here. Thanks for sharing them.